Samsung Galaxy S4 Mini release date and price: where can I get it? Arriving a little earlier than anticipated, Samsung has officially launched the Galaxy S4 Mini, the fresher, younger, and of course smaller version of its flagship, which will offer a slightly more budget-friendly option that keeps in line with Samsung's high-end design. But where might you be able to get your tiny hands on the scaled-down handset, and when will it actually arrive on UK shelves? Update: We now have a firm release date for the Galaxy S4 Mini, with one online retailer revealing it will start shipping orders on June 29. Update: Phones4U was the first UK retailer to announce it would be offering the new Galaxy S4 Mini handset, and has given the phone a release date of July 1. Update: Carphone has also jumped on the Galaxy S4 Mini bandwagon and if you thought Phones 4 U's SIM-free price was ambitious brace yourself - it's £429.95 here. Of course you can always plump for a contract, which start at £26 per month over two years, giving you a free Galaxy S4 Mini to boot. In terms of a Galaxy S4 Mini release date Carphone is also saying it expects stock to arrive on July 1. For those hankering for something better than still photos, operator Three has posted a video giving an up-close-and-personal look at the Samsung Galaxy S4 Mini, putting it side by side with the standard Galaxy S4 and the 6.3-inch Galaxy Mega. Unsurprisingly, the network has also confirmed that it will be offering the phone, though it hasn't spilled anything on date or price yet. 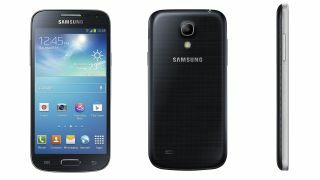 EE confirmed to TechRadar in a statement that is plans to stock the Samsung Galaxy S4 Mini "from launch". It also stated that the phone will be available on its speedy 4GEE service, as well as on the 3G-only Orange and T-Mobile networks. EE's keeping schtum on price and availability for now though. Update: O2 has its Samsung Galaxy S4 Mini pre-order up, but you'll have to fork out a little more each month if you want a free handset - £37 per month to be exact. There's no sign of a S4 Mini release date (or PAYG price) yet on the O2 site, but we reckon it'll fall in line with the July 1 date which is doing the rounds. Vodafone is much the same, confirming it will be stocking the phone but not giving any details beyond that. The bad news is that the Mini will be too early for Vodafone's 4G rollout, which is now being delayed until the end of the summer. Update: Now if you fancy being one of the first to get their grubby paws on a Samsung Galaxy S4 Mini then you may want to check out Unlocked-Mobiles which claims it will start shipping the handset on July 29, and it's only asking £364.98 for the privilege. Clove on the other hand is asking for £376.80 of your hard earned bucks for an S4 Mini, with shipments also starting on July 29. Meanwhile rival HandTec has the Galaxy S4 Mini listed at £389.99 and reveals its "in stock" for "express delivery". Expansys has the white (£399.99) and black (£434.99) S4 Minis up, but tells customers "ordered on request, please contact us for details" - which is a bit strange.